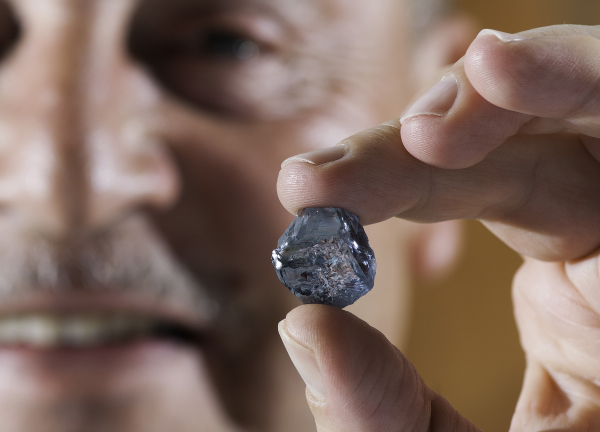 CEO Johan Dippenaar holding the exceptional 29.6-carat blue diamond recovered in January 2014. Petra Diamonds (LON:PDL) has hit the jackpot twice this year, going from finding a spectacular 29.6-carat blue diamond at its Cullinan mine in South Africa last month, to selling it Friday for $26 million to US luxury jeweller Cora International NY. The precious rock, described as an “outstanding vivid blue diamond with extraordinary saturation, tone and clarity,” is the biggest of its kind found at the mine, which Petra controls since 2008. "This sale result affirms this stone as one of the most important blue diamonds ever recovered," Petra Diamonds Chief Executive Johan Dippenaar said in a statement. Last year, another exceptional 25.5 carat blue diamond was found in the same mine, and sold for almost $17 million. Diamonds from both the Cullinan mine in South Africa and the Williamson facilities in Tanzania, owned by Petra, have been displayed at London's Buckingham Palace and are regarded as among the rarest and most valuable in the world. The 1905 Cullinan Diamond has been cut into two stones – the First Star of Africa and the Second Star of Africa – and form part of Britain's Crown Jewels held in the Tower of London.